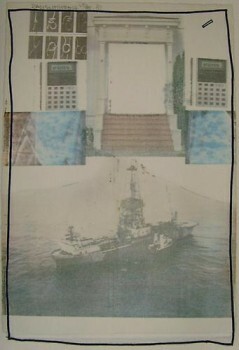 One of 30 unique impressions. 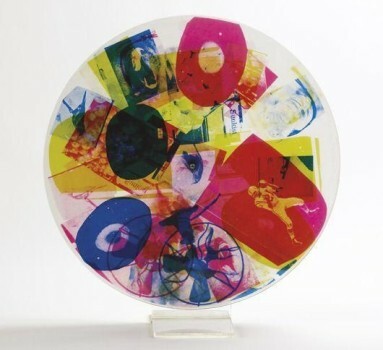 3 screenprinted spinning plastic discs mounted on plexi base. 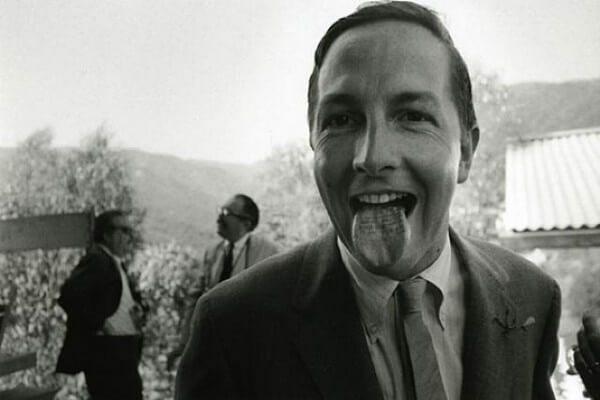 Robert Rauschenberg was an American artist best known for his bold and inventive contributions to the Abstract Expressionist and Pop Art movements. 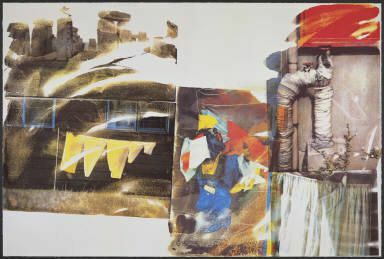 Born in Port Arthur, Texas in 1925, Rauschenberg first recognized the capacity of his artistic talents while serving the U.S. Military in 1947. Following his time in the service, he pursued art studies at the Kansas City Art Institute prior to attending moving to Paris to attend the Academie Julian. 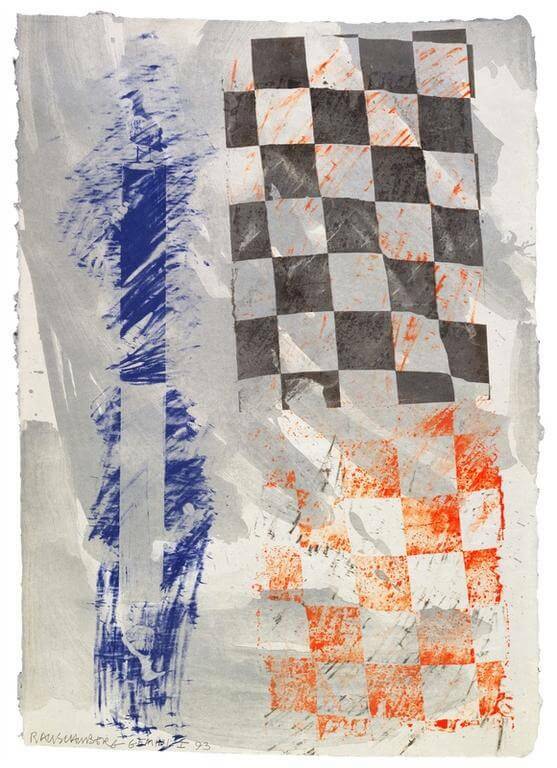 After less than one year in Paris, Rauschenberg found himself dissatisfied with the European Abstract Expressionist art scene and returned to the United States, opting to continue his studies at Black Mountain College in North Carolina, learning from Bauhaus founder Joseph Albers. At that time, the school had become a hotbed of avante garde collaboration and featured a number of talented artists who began drawing national attention, including dancer Merce Cunningham and musician John Cage. In the early 1950s, Rauschenberg’s Abstract Expressionist works included series of monochromatic paintings, singular color works, considered alternatively confounding and inspiring. 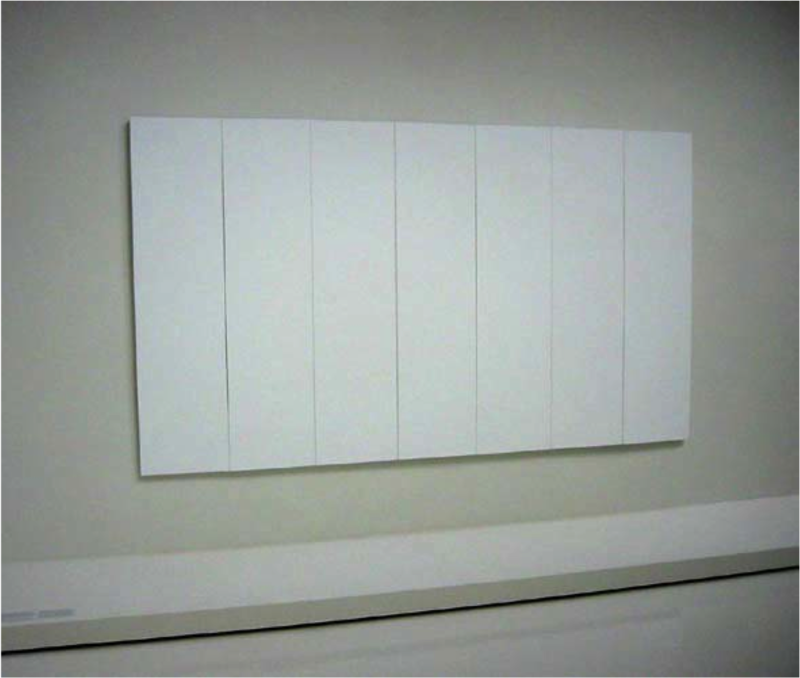 Within the 1951 White Paintings series, the artist proposed that his seemingly static white paintings were actually dynamically altered by ambient components − shadows, natural and artificial lighting, dust particles and angles of view – in fact changing the work itself. 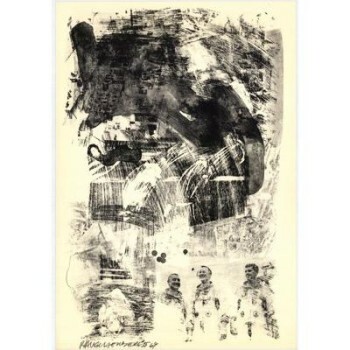 Robert Rauschenberg’s black paintings were similar in terms of ambient sensitivities, but these works also included a new dimension of texture provided by embedded pieces of newspaper that were added to canvases. The newspaper would sometimes be completely covered in paint, barely distinguishable, and other times left partially revealed, print and all. 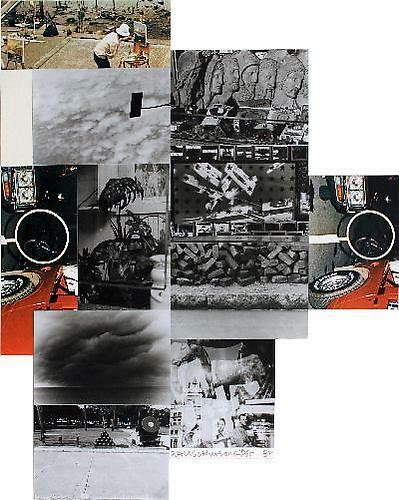 Following the Black Paintings, Robert Rauschenberg’s Red Paintings stepped the artist into a new realm of works called “Combines,” a style of works for which Rauschenberg would become most famous. Rauschenberg’s Red Paintings (1953-1954) introduced assorted cuts of wood, nails and other materials to the monochrome layers of red paint. Additionally, Red Paintings included enhanced textures created by paint application processes – such as drips, spatters, washes and bold horizontal strokes. 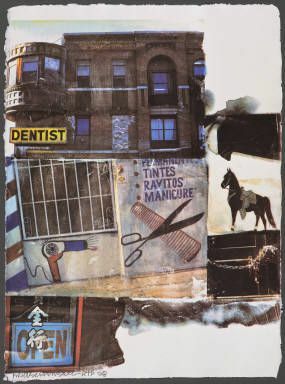 As the name indicates, “combines” is the term applied to the works of Robert Rauschenberg that put together a combination of objects, causing the viewer to ponder the meaning of the often surprising juxtapositions. Rauschenberg would actively collect rubbish found on the streets of Manhattan, to include these items within such works. 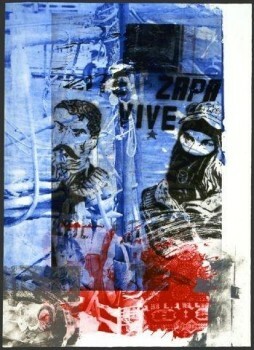 The unpredictability of what could be found energized the artist’s philosophies of art as an unpredictable exploration. 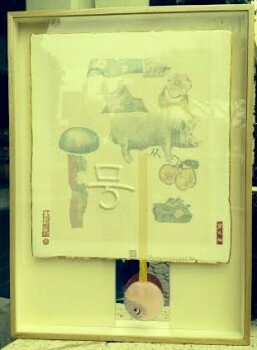 Robert Rauschenberg noticed that even in juxtaposing seemingly meaningless elements, he could nonetheless tell a story and elicit emotions, even common emotions, based upon the collective meaning or significance that particular objects represent in popular culture. This philosophical approach played an important role in laying the foundation of the Pop Art movement. 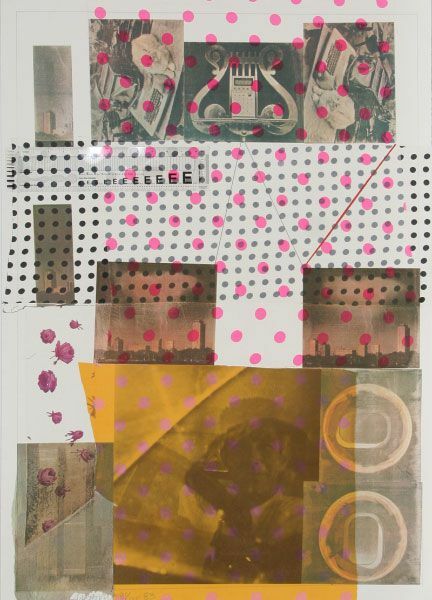 For Pop Artists such Andy Warhol and Roy Lichtenstein, it was merely a short jump from the inclusion of popular objects in the works of Rauschenberg to placing sole focus on Pop icons and manipulating or morphing identifying characteristics. 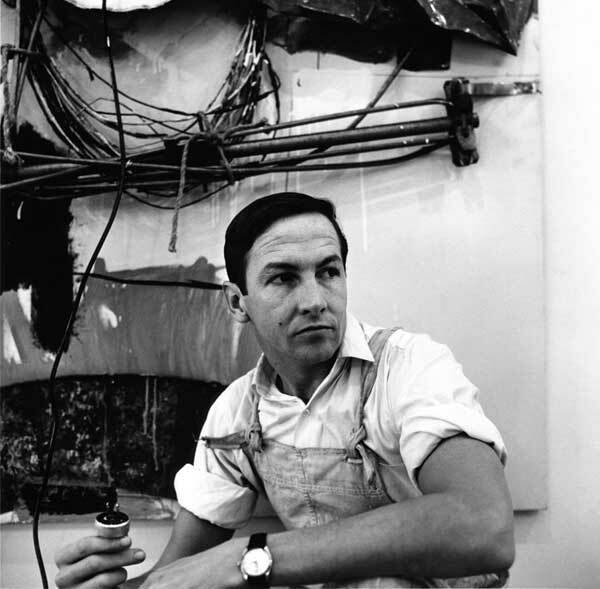 Among Robert Rauschenberg’s significant “combination” contributions includes collaborations forged between visual art, performance art and even engineering. 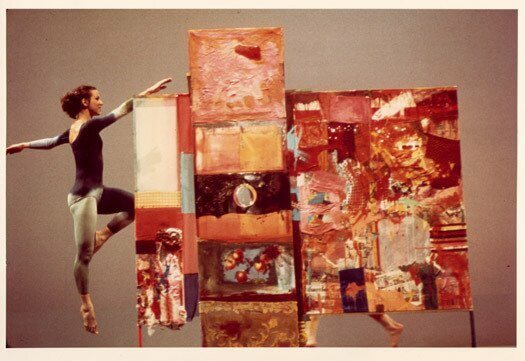 Throughout his career, Rauschenberg designed sets and costumes for dance, most regularly for the Merce Cunningham Dance Company. In 1977, Rauschenberg collaborated with Merce Cunningham and John Cage, both of whom he befriended as a student at Black Mountain College. 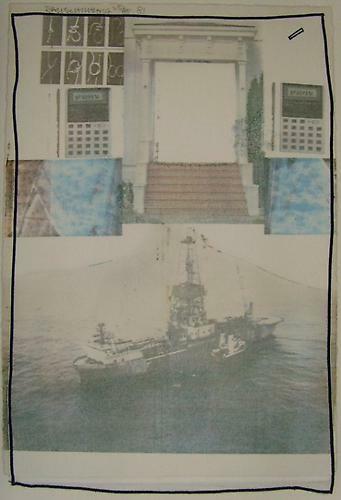 Working with engineer Billy Kluver, Rauschenberg founded a non-profit organization called E.A.T., standing for Experiments in Arts and Technology. In gratitude, NASA invited Rauschenberg to witness to the launch of the Apollo 11 rocket and provided the artist with access to archival documents and images. 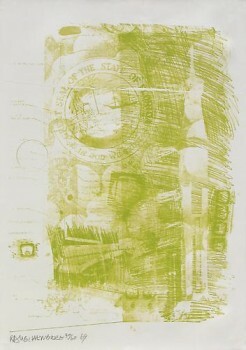 Rauschenberg created his “Stoned Moon Series” of lithographs as his response to this historic event and unique opportunity. 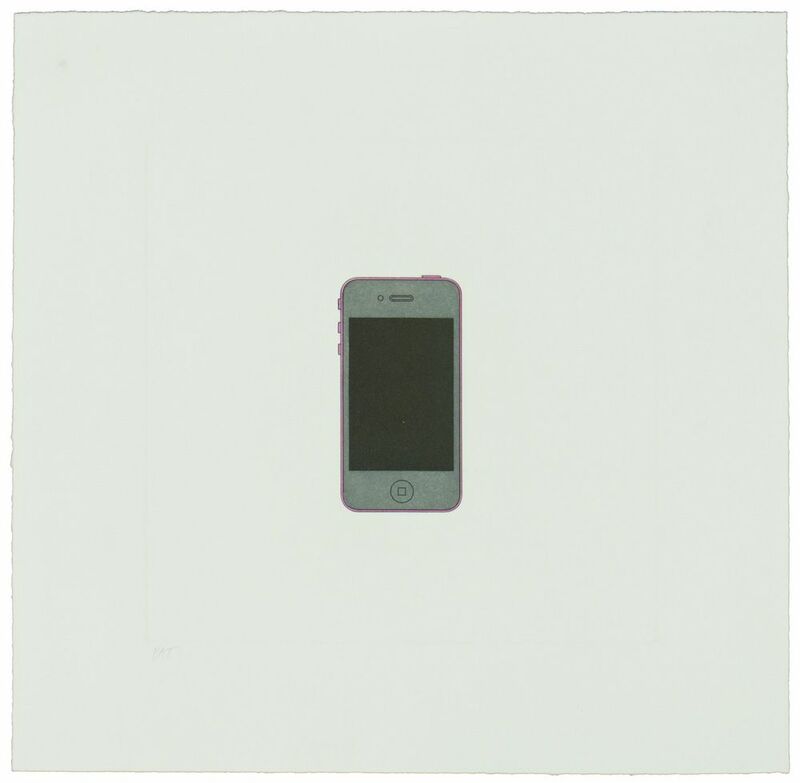 These lithographs would become shining examples of powerful Pop Art printmaking. In 2008, Robert Rauschenberg died on Captiva Island, FL, where the artist worked exclusively in his later years. 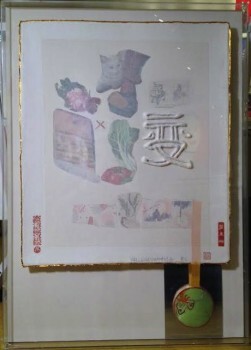 The artist’s works continue to be highly sought, many hanging in galleries and exhibits throughout the world. Care to learn more about Rauschenberg? 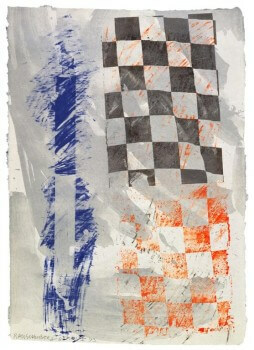 Read Robert Rauschenberg: Highly Contextual on our blog. 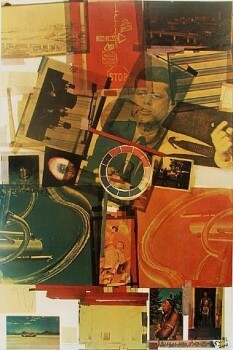 Robert Rauschenberg, “Monogram,” 1955-59. Taxidermy goat, tire, mixed materials. 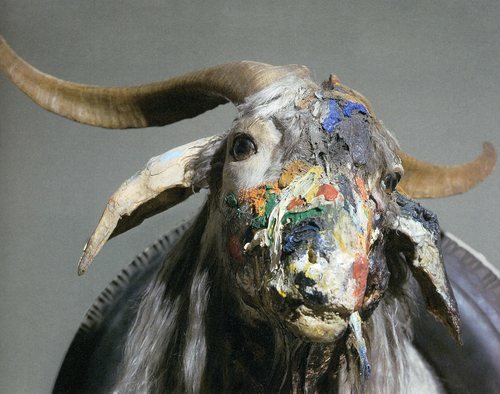 The retrospective, Robert Rauschenberg: Erasing the Rules, has traveled from the the Tate Modern in London, to MoMA in New York and is now at the San Francisco Museum of Modern Art. 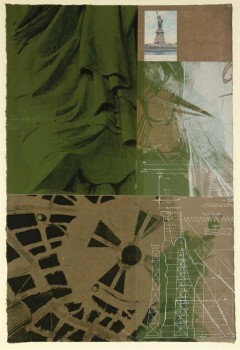 The show, which includes more than 170 works by Rauschenberg, will be on exhibit through March 25th. American fine print artists have created some of the most powerful political and patriotic works in history. 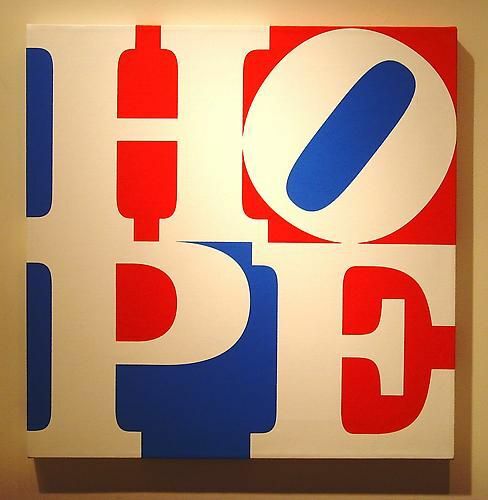 See how Shepard Fairey, Warhol, Lichtenstein, Robert Indiana, Jasper Johns and Robert Rauschenberg have shaped the political landscape. Robert Rauschenberg’s 1/4 Mile or 2 Furlong Piece is going to be exhibited at the Ullens Center for Contemporary Art in Beijing from June 12 through August 21.